Imagine the holy grail: getting the right message to the right customer at exactly the right time — every time. And what if you could deliver hyper-relevant cross-channel customer experiences that amplify loyalty and result in increased Average Order Value, reduced churn, and increased conversions faster? 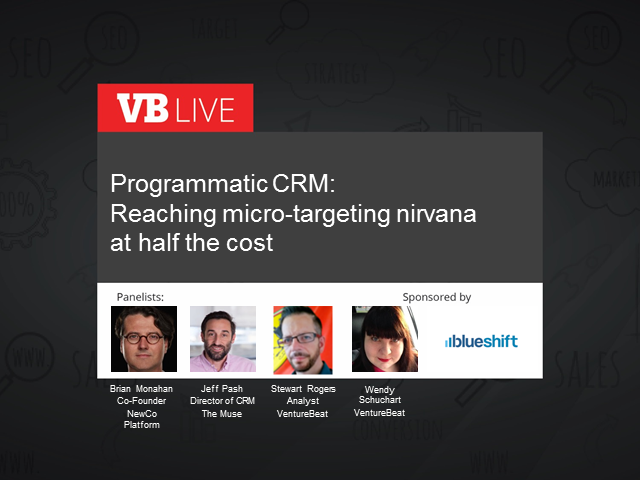 As hyper-scalable programmatic technology shifts from the adtech space and into the martech world, organizations are, for the first time, able to leverage predictive scoring on an incredible scale built upon a real-time view of every customer. Leading companies have already implemented user-centric strategies that place an emphasis on marrying systems of record, systems of intelligence, and systems of action to create what is now being called Programmatic CRM. Join master marketers in our latest VB Live executive event, where you’ll learn how to turn martech innovation into user-centric, budget-stretching, personalized marketing that works. * Prevent or eliminate the potential of fraud.